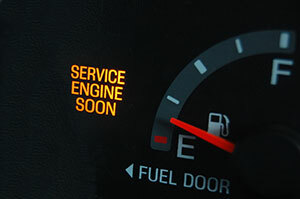 When the Check Engine Light or Service Engine Soon message comes on in your vehicle it’s notifying you that your car’s systems need some attention from a mechanic. When you bring your car into Bowes Exxon Car Care Center here on the corner of Butler Pike and W North Lane one of our ASE certified mechanics can quickly determine the reason the light is active using our state of the art code scanner equipment. Some of the codes our mechanic may find are only warnings of potential problems while others may be notifying you of a pending breakdown and remedial action should be taken promptly. Diagnosing your check engine light only requires a short time. Please give us a call at 610-828-6522 or fill out our appointment request form and let’s work together to keep your car in safe tip-top condition for you and your family.